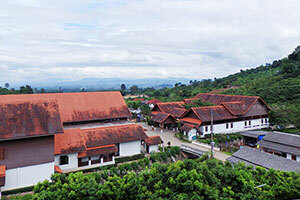 The First Royal Factory at Fang Museum is located at Ban Yang Village, Moo 12, Mae Ngon Sub-district, Fang District, Chiang Mai Province. This museum was established to answer the objective of making the Royal Factory an educational destination regarding agro-processing industry and a place that collects and displays Royal initiative projects for sustainable development of “Sufficiency Economy”. The beginning of the idea to establish this museum is the flood and mudslide incident during 6-8th of October, 2006 which caused damage to the area of Mae Ngon and Mae Kha Sub-district of Fang District, Chiang Mai Province including the First Royal Factory at Fang which was completely damaged from the incident. After the disaster, HSH Prince Peesadej Ratchanee had visited the victims in the affected areas and ordered officials from the Royal Irrigation Department to find the way to prevent the incident from happening again. He also assigned works to other departments to help solving the problem. In January, 18, 2007, HRH Princess Maha Chakri Sirindhorn had also visited the area of the First Royal Factory at Fang. After consulting with the Office of The Royal Development Projects Board about the restoration of the factory and nearby community and also the development of Mae Ngon watershed area, the princess assigned the Crown Property Bureau to plan the First Royal Factory at Fang development and restoration project. To know the works of His Majesty the King in a comprehensive and sustainable development in a museum space with living (Living Site Museum), which includes the Royal Exhibition Building and Royal Factory plant ,Bann Yang communities. You will also, select the best products, "Doi Khum" of eating a souvenir, too Inside the museum are exhibited in three main projects is Royal Project, The first plant of Royal Deli (Fang) and Doi Kham Food Products Co., Ltd. The staff take visitors inside the museum. Travel From Chiang Mai - Fang go to Highway 107, around 150 km to the side, then turn left into a separate Ang Kang, just 9 km.